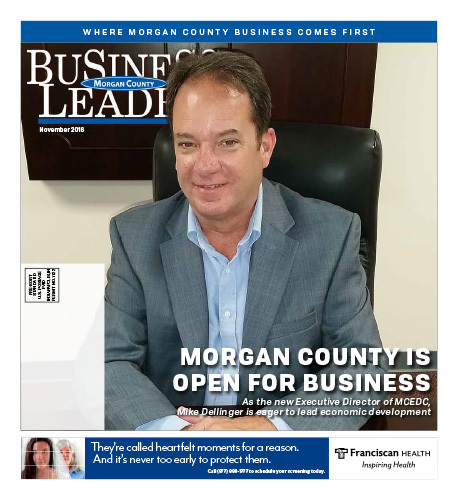 According to Mike Dellinger, the new Executive Director of the Morgan County Economic Development Corporation since May 2, 2016, Morgan County is on the cusp of something big. “Morgan County has a great story to tell and a great future ahead of it,” Dellinger said Morgan County is open for business. As the new Executive Director of MCEDC, Mike Dellinger is eager to lead economic You might think that a rather bold statement from someone who came from Iowa and has only been in the County for six months, but for Dellinger, returning to Central Indiana was a homecoming. The new executive director grew up in Noblesville. His father was a government teacher at Noblesville High School and an elected representative in the Indiana House of Representatives. Dellinger says that he grew up knowing he wanted to be involved in public service. What really set the hook in him happened after he graduated from Ball State and was an employee of the City of Noblesville. It was 1988 and he was assigned the task of working on a TIF (Tax Increment Funding) project. During that time, he discovered how economic development and tax programs can work together to benefit commerce and the community.